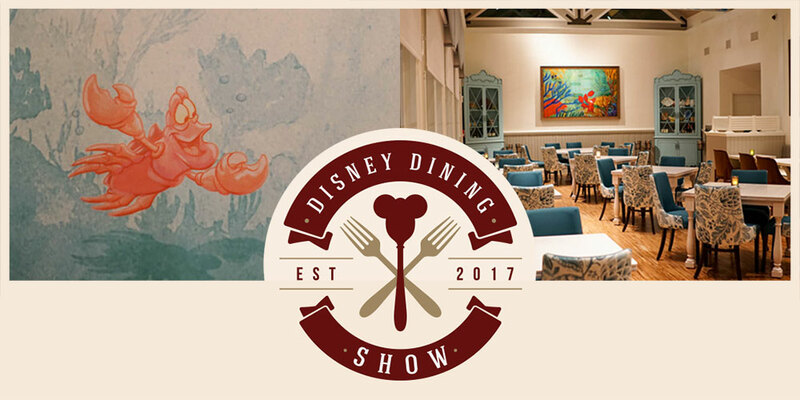 If you’ve seen a few episodes of the Disney Dining Show, you know that there is a tremendous amount of context that must be included with each Walt Disney World or Disneyland Resort restaurant review. These eateries have history; they have a reputation among both fans and critics alike that can easily influence the level of service and food quality a guest expects when they show up come mealtime. That is why the lot of us — Pete Werner, Steve Porter, guest-diner Eric, and myself — absolutely jumped at the chance to experience dinner at Sebastian’s Bistro, the new Caribbean-inspired table service eatery that is just one of the results of the Caribbean Beach Resort’s lengthy construction phase. 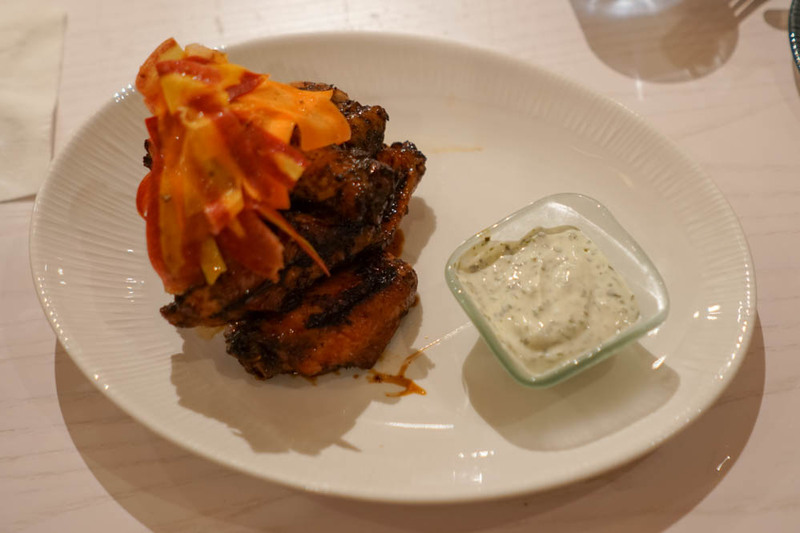 Seeing as how Sebastian’s is brand new, not just newly reopened or re-imagined, we didn’t have any previous experiences or culinary baggage which could lead to preconceived notions. Yet with Disney dining, there is always some sort of precedent to go by. 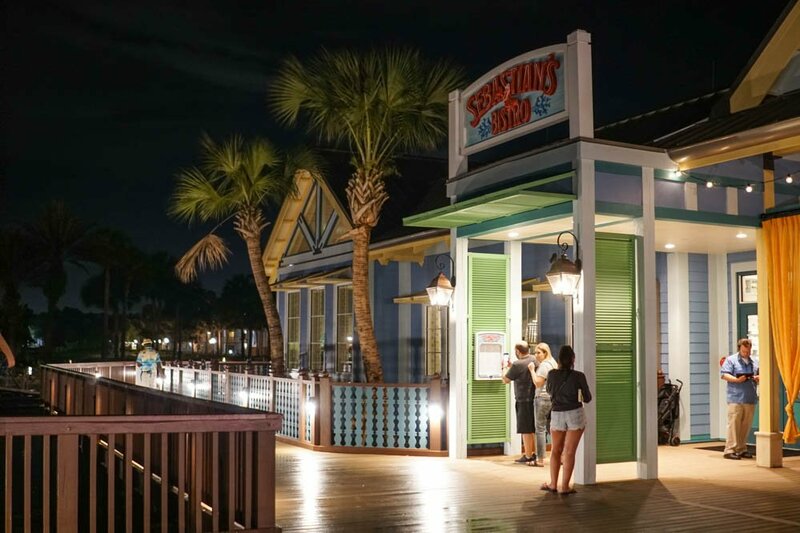 It might seem unfair to compare this new establishment to Shutters — Caribbean Beach‘s notoriously disappointing, previous Old Port Royale table service offering — yet as we found out during our meal, much of the staff were actually Shutters veterans. With that in mind, this opening night proved to be truly surprising. *If you’d care to digest your food review in watchable form, our video discussion of Sebastian’s is embedded at the bottom of this article. For all other Disney Dining Show reviews and discussions check out DISUnplugged.com, where you’ll also find a vast catalog of shows to satiate all of your Disney curiosities. We checked in 10 minutes prior to our 8:40 pm reservation, and were seated by 8:50. The cast members seemed friendly and knowledgeable from the start. Our server Miguel, of whom I will speak in more depth in the service section of this article, promptly gave us an explanation of the tone of this new establishment combined with menu highlights and drink recommendations. This process was executed well. Although it may seem like an arbitrary compliment, a hassle-laden check-in and seating process can truly set a bad tone for the rest of the night. This was our first impression of a brand new eatery, and it was done in such a fashion as to build anticipation for the meals to come. While Sebastian’s Bistro certainly had the air of a just-opened eatery — with clean, uniform paint on the walls, polished floors betraying not a single scuff, and upholstery unmarred by any loose threads — there was an element to the crisp cleanliness that did not play to it’s favor for some of us. First though, a brief description. Sebastian’s consists of two dining areas aesthetically separated by one well-placed booth, both featuring a consistent table layout. As you take a hard left just after the host station and decorative partition, you’ll walk through an initial dining area with four-person tables on the floor, a procession of two-person tables lining the windows, and a row of booths hugging the interior wall. That trend continues throughout the larger dining room, only with the addition of some larger tables on the floor space. Utilizing a clever design, both areas convey a sense of intimacy while also avoiding the feeling of clutter or claustrophobia that occasionally accompanies it. Guests heading to the restroom will have no difficulty navigating around servers running dishes, and this gives the building a sense of ease and relaxation. Even the most high traffic area in a restaurant, the dreaded kitchen-adjacent table, appeared like a comfortable candidate for family dining. From the waterfront-view window seating (perfect for romantic couples’ dining) to cozy booths and accommodating tables, there did not appear to be a bad seat in the house. Make no mistake, though, this restaurant is not large by any means. 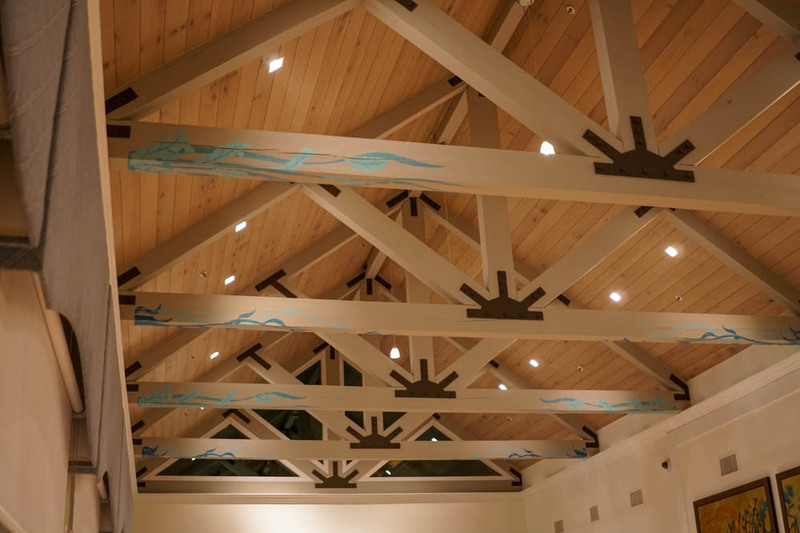 Much of the spaciousness comes from the floor layout and vaulted ceilings of the main room, which are braced by soft-colored timber with a calming aqua floral seaweed design. The lack of clutter, and lack of decor in general, help create an expansive space within the natural constraints of the small structure. The aforementioned lack of distracting decor does have its downsides, though. 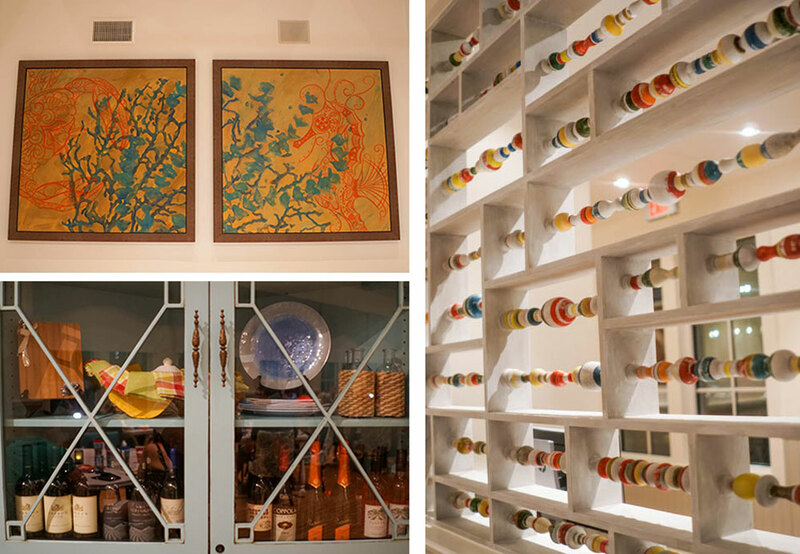 What is included among the restaurant’s accent pieces gains even more attention. Within a sea of off-white walls and subtle gray wainscoting, eyes are naturally drawn to the only sources of vibrancy in the area. With a few creative choices, this would serve as a strength. 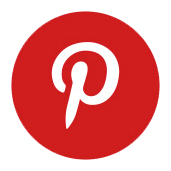 Sadly, many of the designer’s aesthetic additions seem uninspired and droll. Our friend Eric said the feeling was reminiscent of a Holiday Inn. If I had to choose a culprit for that statement, I’d blame the art and upholstery. I felt that the overabundance of whites felt sterile — an acceptable word for a kitchen, a great adjective for a hospital, but completely out of place for a dining room. While I was remarking on the poor choice of chandeliers, our superlative server Miguel (proving that no question would be left unanswered on his watch) quickly let us know that they were merely placeholders for custom designs on order. Sebastian’s, it seems, still has a few finishing touches to add. I doubt these will drastically alter the feel of the place, as the building we saw was nearly identical to Disney’s concept art released earlier. On the incredibly unlikely chance that anyone involved with the restaurant reads my review, I believe that by shifting the decor slightly away from Caribbean-inspired and closer to Caribbean — maintaining a focus on quality, not quantity — Sebastian’s could quickly transform from comfortably sterile to charmingly inviting. As it stands, the location is utterly devoid of theming. 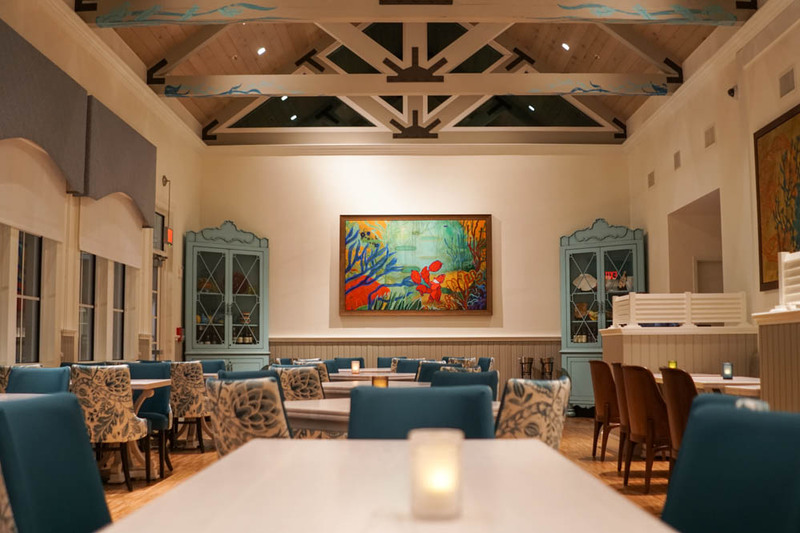 The decor isn’t Caribbean enough to bill itself as Caribbean-themed, yet aside from a few paintings featuring the bistro’s titular crab from The Little Mermaid, it can’t accurately be described as Disney-themed. While it is in my nature to over-analyze what makes for good dining decor, it is also in my nature to strive for accuracy. 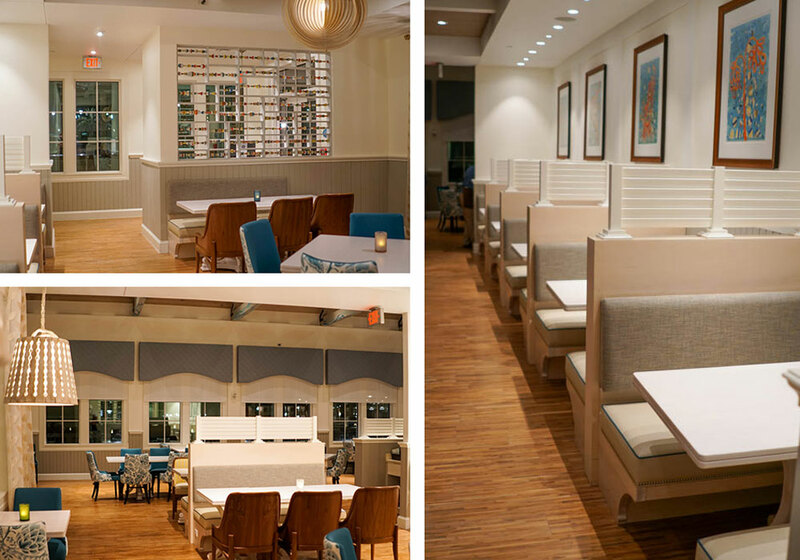 Sebastian’s does have some truly positive design elements, they are just moderately detracted from by its choice in accents and upholstery. 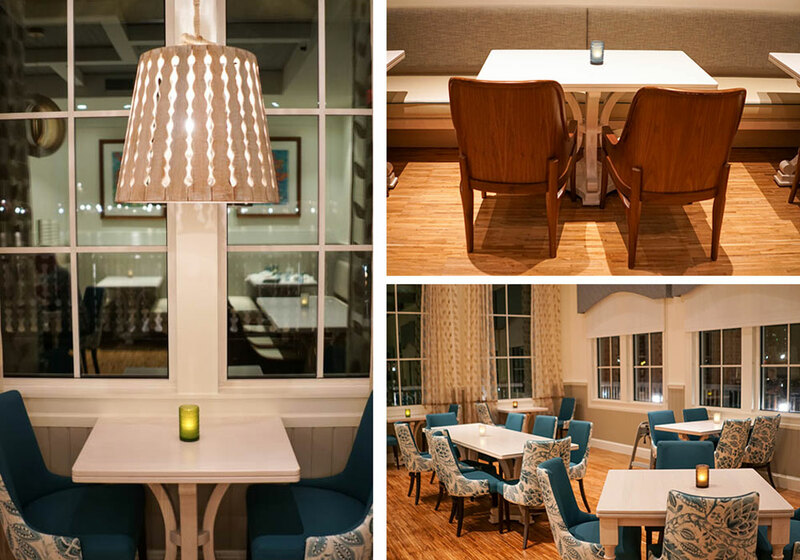 While it is obvious that the color choices are meant to be enhanced by the daytime sun, decor should be chosen that works well in any weather, day or night, and doesn’t lack personality like Sebastian’s Bistro’s dining environment. This libation left Steve with a slight headache, which he attributes to its high sugar content. He found it to be tasty, but it probably won’t be his first choice next time. I am always extraordinarily pleased when I see a unique nonalcoholic cocktail on the menu. Honestly, I rarely even care if it’s any good, I just appreciate restaurants attempting them. This offering happened to be excellent. I am not a fan of sweet drinks, which is why I go for these beverages instead of a soda, and the contents of my glass were crisp, refreshing, and interesting. The undertone of the ginger beer served as a perfect base to pinpoint the other flavors, and the cinnamon was a delightful addition. Pete ended up satisfied with his choice, and although I’m not a fan of peach drinks myself I have to admit that I tried a sip (separate straw, because not contaminating your boss is a safe career move) and it was very good. I generally don’t begin with my favorite dish; I enjoy building up to it. 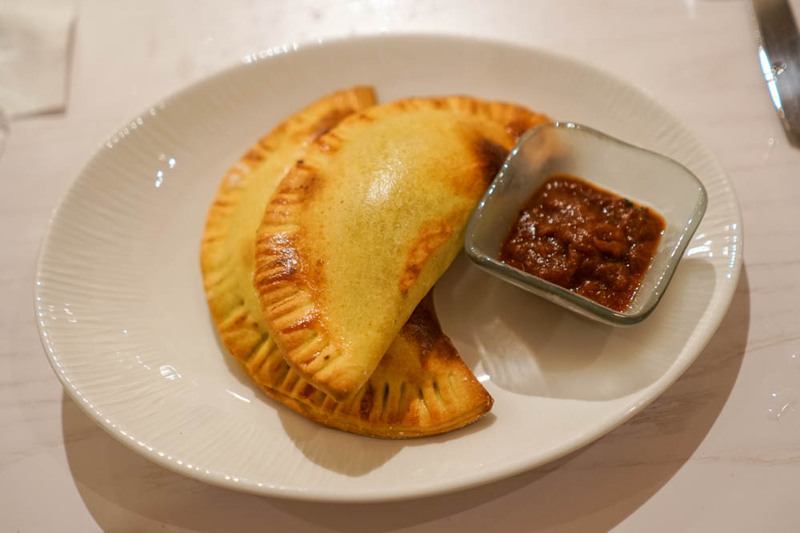 I feel these Jamaican Meat Pies really set the standard for what I could expect from this restaurant throughout the rest of my night, so I felt obligated to begin this culinary journey with my personal favorite of the appetizers offered. You can get some version of these guys anywhere; that’s why I chose them. I’ve had good versions and bad, all for less than $4 a pop. The recipe is generally pretty simple, spiced meat inside dough, but sometimes a simple recipe leads to the widest variation of quality. I just had to know how a Disney restaurant would handle this dish. I found out, and am very happy I did. At $12 for the pair, these things break down to $6 a pop. If Disney had the resources to serve this street-food-style (or park-food-style) it might be all I’d ever eat. The dough was perfect on its own, but the seasoned meat inside was delicious. Like almost every other dish in the place, it came with an accompanying sauce that was flavorful and fun — the pies were so tasty on their own that I barely used it. Firm on the outside, soft and buttery on the inside, a flavor so rich and sweet that it open its doors to its saucy neighbors and warmly welcomes them to hop inside and stay for a while. The accompanying butter, oil, and chutney are creative and flavorful; this dish could represent with just a box of Triscuits as a tasting platform. Yet, the true stars may be the fresh-made rolls themselves. I know that they were fresh made, because they had run out of them and created this batch just for us. I don’t know if a better sauce administration tool exists than these pull-apart beauties. The table ranked the sauces and found ourselves in agreement. The chutney was alright, but the least impressive of the trio. The guava butter was perfectly suited for those with a penchant for rich flavor. The Jamaican Jerk Oil though? I may lose composure and leave this article unfinished as my brain sinks into a repeating loop of flavor memories from which my fragile mind can never return. Disney, if you’ve made it this far into the article: Sell this stuff out of a plastic bottle in convenience stores, market it as a health beverage, watch your profits skyrocket. The FDA lets tons of that stuff slide these days. I will promise to drink a minimum of 3 pints per day. I think that half of our party found this to be their favorite appetizer. While I don’t agree with that opinion myself, you may have noticed that these appetizers haven’t faced a lot of harsh criticism so far. Our favorites appear to just be personal preference, and many of us switched our opinions with each new dish that we sampled. The wings were sizable and delectable. I was a bit worried about Sebastian’s treatment of jerk seasoning going into this meal. Disney isn’t known for accurately replicating spicier cuisines. Their burden to bear is a need to make every meal have mass appeal. I’ve eaten countless Louisiana-inspired dishes on property completely devoid of the spice that the region is world famous for. So Sebastian’s task was to take a style that most people enjoy spicy, remove the kick, but keep the flavor. At this, I think they managed surprisingly well. While not my favorite on the table, you’ll likely never see me turn down a chance to consume a few of these avian appendages. I enjoy a good crab cake. I’ve can honestly say that I’ve got a pretty solid background of crab cake experiences. What I can’t say, is that I have eaten every crab cake on Disney property. I think Steve Porter can. I don’t know why. I’ve been present for so many instances of Steve’s crab cake consumption, yet clearly a small fraction compared to the infinite number of these Disney dishes he has devoured. I am desperate to find out my friend’s secret crab cake-related backstory. Did his great-grandfather invent the crab cake, launched under the name “the Porter Patty,” only to have his ideas stolen by charismatic con artist and so-called “inventor” of the Baltimore Crab Cake, Crosby Gaige? Now, Steve feels the need to spite-gobble all of these falsely attributed seafood staples? 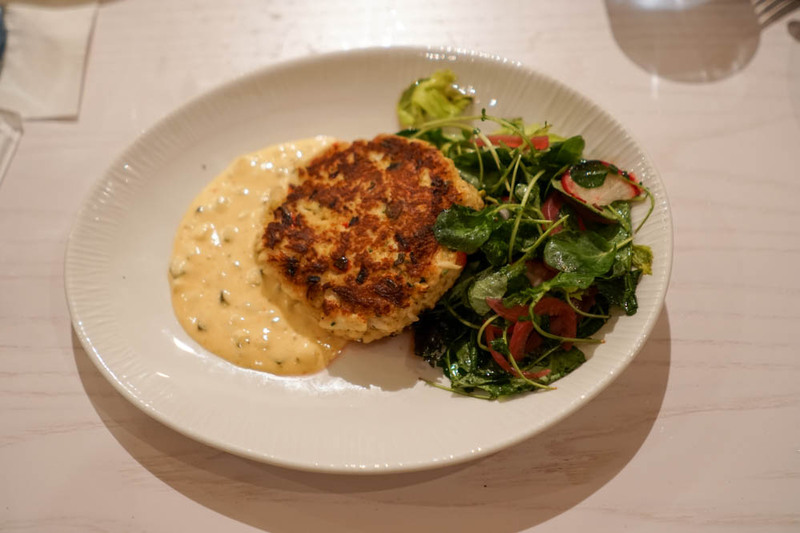 That is simply one of many theories, but experience has taught me that the best source of Disney crab cake information was seated just a question away. Steve thought this was clearly the best crab cake on Disney property. It was one of the best crab cakes the rest of us had tasted anywhere. The consistency was tender yet stable; it neither fell apart nor required any effort to cut with a fork. The recipe didn’t skimp on the crab, which was seasoned to a fine flavor. 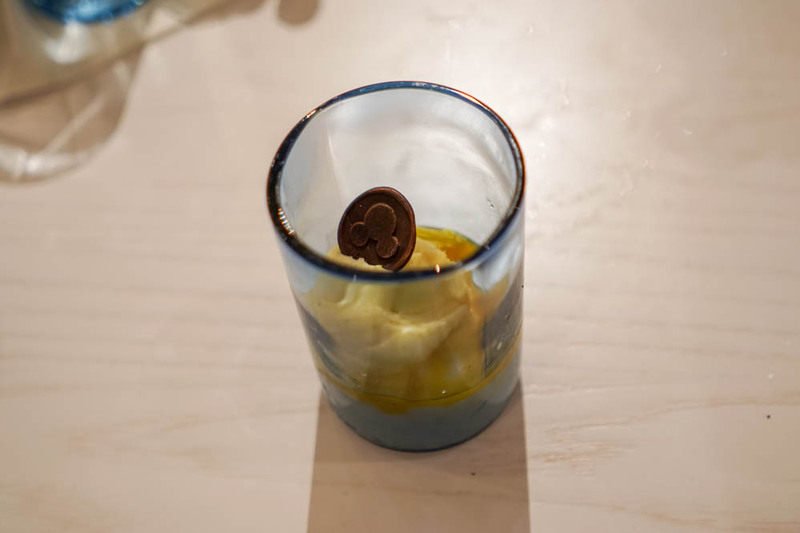 Once again, the sauce pairing of herb mayonnaise was brilliant — it didn’t distract from the flavor or overwhelm it, it simply added something extra with hints of acidity and a pickled taste to it. This shareable assortment was probably the lowest on our list, which says a lot because it was quite good. 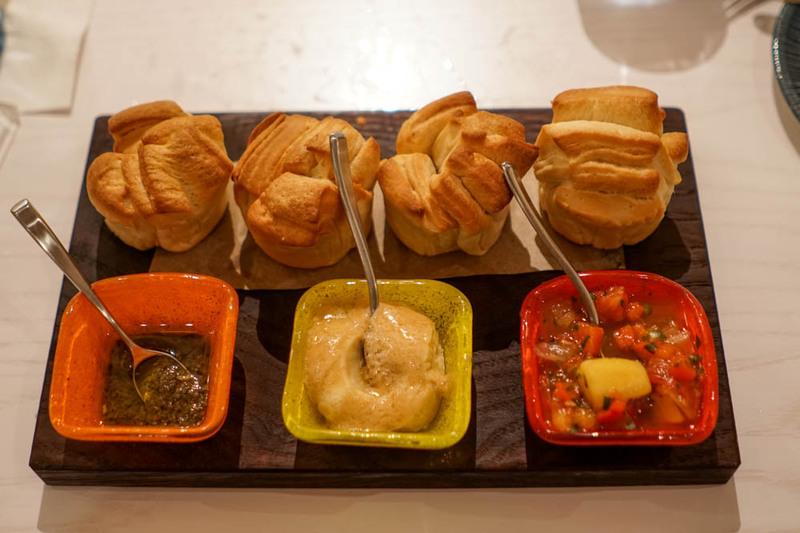 Each of the accompaniments was constructed from quality ingredients. 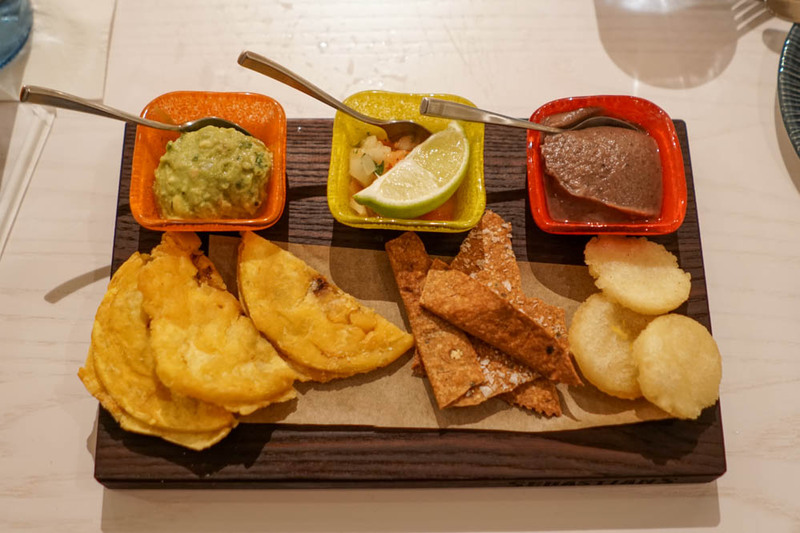 The tostones and arepas were tasty, and the house made crackers were highly salted and worked exceptionally well with the guacamole. This dish takes fewer risks than the others, but generally delivers on its promises. The price tag is a bit surprising, as at $15 you may want to try another starter, particularly the comparable pull-apart rolls. Given the cost vs. quality of the other dishes, I’m a bit unsure as to why this one warranted a higher price. Not a bad dish sampled, we all came to the conclusion that each appetizer offering was well worth its asking price. Our knowledgeable server Miguel describes this dish to Pete as “a deconstructed taco.” Pete was of the opinion that were this to be reconstructed it would be the best taco he’d ever had. The pulled pork was tender and saturated with flavor, and although the sides may seem simple they were prepared surprisingly well. 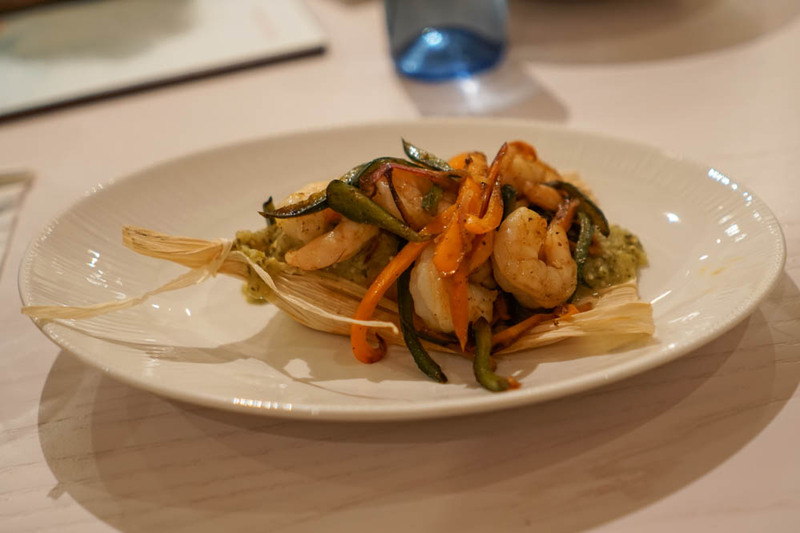 No stranger to shrimp or tamales, this dish was Eric’s entrée of choice. He thoroughly enjoyed the meal as whole, with a special nod to the tamales and salsa verda. All of the elements combined well with each other so that each ingredient could be enjoyed on its own, but the flavors acting together changed this dish from simple to remarkable. His singular complaint was that he would have appreciated a greater presence of shrimp. Neither Steve nor I had ever eaten cobia before. I throw myself into the mix because naturally we all sampled each other’s meals (using separate forks, because not contaminating your coworkers is good for workplace morale). That being said, I agreed with all of Mr. Porter’s observations on the featured sustainable fish. 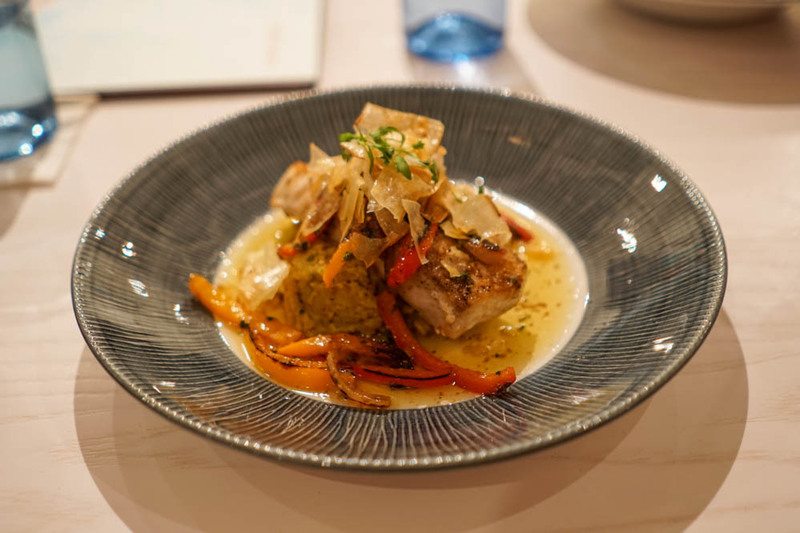 Flaky, juicy, and flavorful, their preparation of the cobia was on point. None of us had ever heard of Escovitch sauce before, and had I ever eaten it I was probably unaware, so I can’t speak to its authenticity. I can speak to its flavor, which did wonders to compliment the delectable fish. I am not a fan of plantains in any of their forms, but everyone else at the table absolutely loved the side of mashed fruit. If you enjoy plantains even a little bit, you’ll probably love it as well. I saved mine for last not just because I can speak on it the most thoroughly, but because this dish is probably the least appealing to a large audience, which is a problem that I mean to rectify. I’ve had some form of this dish many times, usually home cooked, and always wonderful. Sometimes it’s been milder, sometimes spicier, but many Americans’ natural aversion to goat is hindering some great culinary experiences. Aside from the protein source, another reason this dish seems inaccessible to many is the preparation style. Most times I have eaten it, the goat was chopped into chunks — bone and all — and mixed in with the rice. That means if you’re eating your rice with a fork you’ve gotta go to some extra effort to get that goat off the bone. Totally worth it, but a hassle nonetheless. I was curious as to how Sebastian’s could take such a meal and make it Disney-resort-guest-approved. Hard to believe, but they did. Some at the table were surprised they enjoyed goat, some were surprised by the unique preparation; every one of us was caught off guard by the creative take on traditional cuisine. 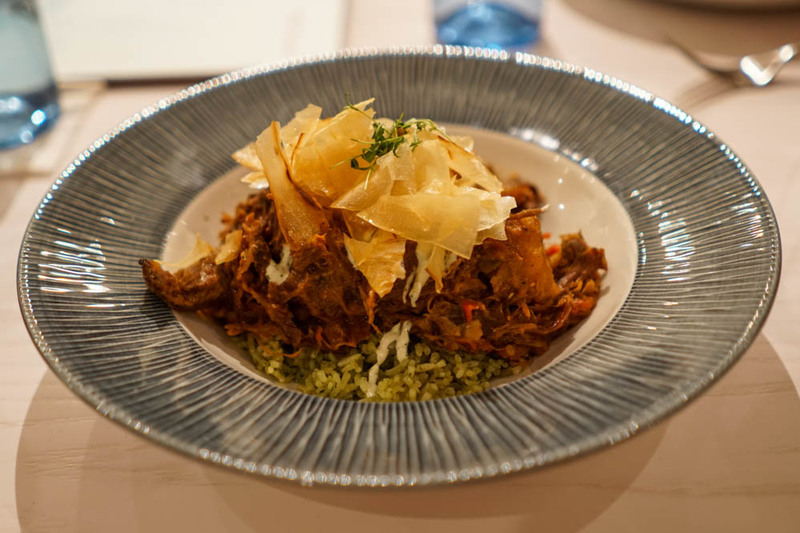 The goat was not dissimilar to Pete’s pulled pork in texture or tenderness, possibly slow-roasted in a similar fashion and without the any extreme chewiness that animal is sometimes known for. 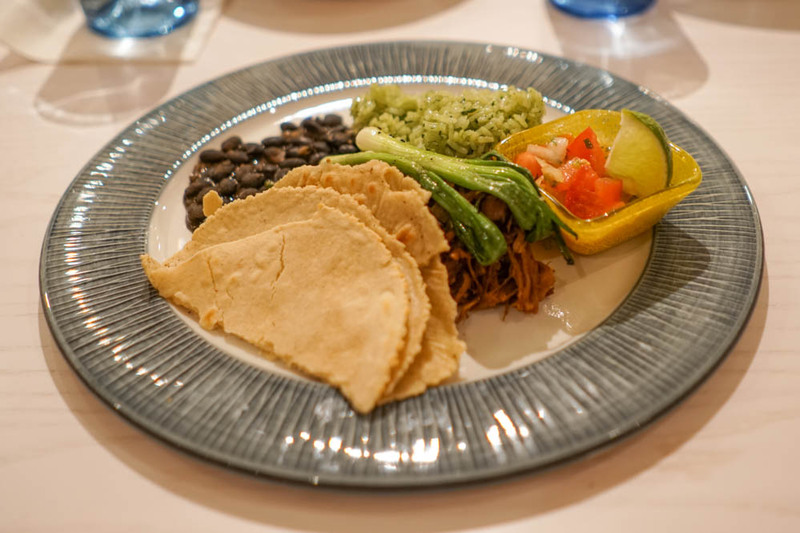 I am not much of a yucca fan, but the crispy shaved slices which topped the dish, when eaten in the same forkful as the goat and cilantro rice, managed to create a wonderful diversity in texture which served to shine a spotlight on the delicious collusion of differing flavors. If you aren’t turned off simply by the word “goat,” please give this spectacular dish a try. My very real concern is that as menus change over time, the overlooked goat dish will be cut in favor of something more universally appealing. Just as we experienced with appetizers, none of our orders were regretted and we found them each to be worth the asking price. 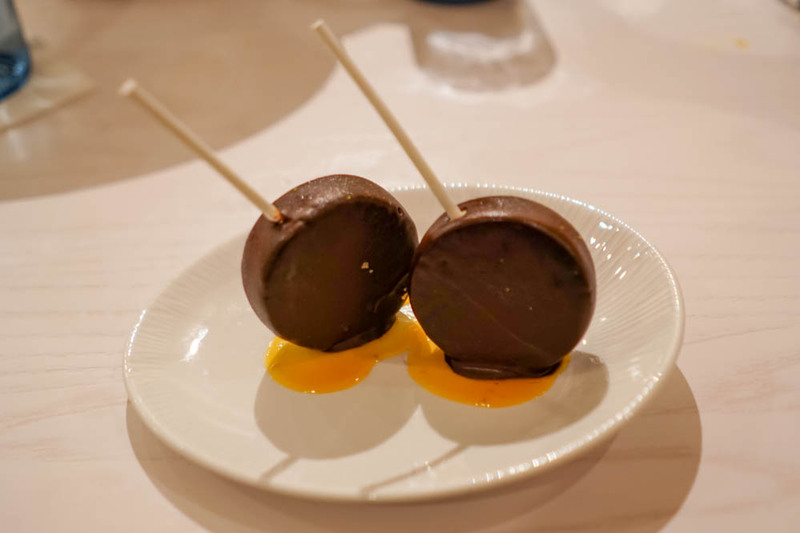 Uninspired and boring, this dessert was simply sweet for sweet’s sake. The texture could have proved a bit fun had more flavor been present, but it was a mild sorbet on top of a sugary yet flavorless meringue. While the serving style of this offering was an aesthetically attractive concept, it’s a shame when I find the arrangement of the food in its container to be more intriguing than the dessert itself. 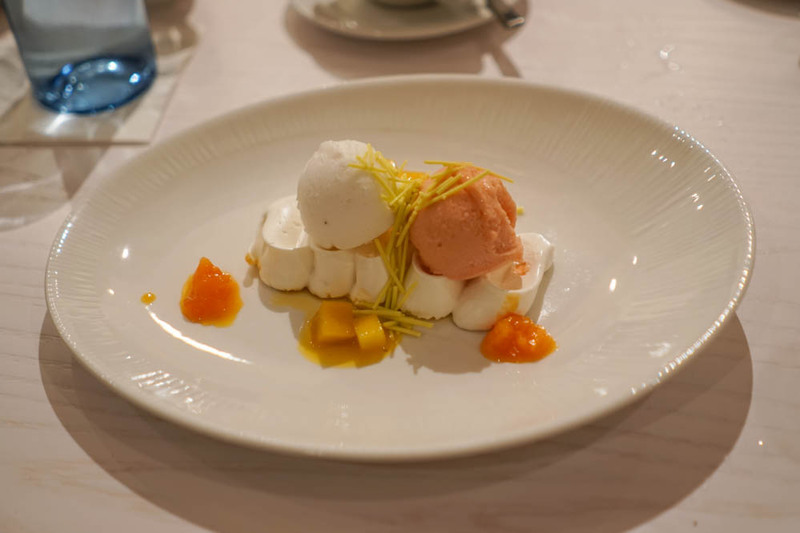 Once again, very low on flavor and the texture of the panna cotta mixed with sorbet didn’t win anyone over. For an instant we were worried that Sebastian’s had spent so much energy on its earlier offerings that they just didn’t have anything left for their desserts. Luckily, Mile Marker Zero came to save us from ending our meal on a boring note. While probably not for everyone, this is another example of divergent flavors harmonizing to create a unique experience. Salted, bitter dark chocolate mixed with a sweet yet tart Key lime pie lollipop made for a fun and exciting finish to our evening’s culinary adventure. In a word: exemplary. Our server Miguel was engaging and enthusiastic while never being overbearing. He knew the menu inside and out, down to the smallest details. When we dine for a review, or just for fun, we latch onto knowledgeable cast members and throw out as many questions as we can think of. Miguel not only always had an answer, but he never struggled or hesitated. While the serving staff trained for around a month or so prior to opening, were we not already aware that it was opening night we would have assumed they had been working at this establishment for years. Service was expertly paced, and we never felt rushed or were left waiting. The place operated smoothly, and once again emphasis must be placed on how good of a sign it is if things go this well on opening night. As I had mentioned in the beginning of this review, much of the Sebastian’s Bistro staff also worked at the previous Old Port Royale table service location, Shutters. This new dining experience is leaps and bounds over the former restaurant. Whether this is due to changes in management, greater resources, or just a better concept is unknown to me, but the result is all that matters. With the exception of a few dessert options, everything we ate was a mix of surprising and comforting. Service was warm and welcoming yet efficient. The decor could use a few improvements, but the overall design makes great use of its space. I would like to see a few meals here that didn’t play it so safe where heat is concerned, stuff that packs a bit of a kick, but Disney aims to please the masses so I understand why they avoided that direction. All in all, everyone at our table gave Sebastian’s Bistro an 8.5 or 9 out of 10. A tremendous showing for opening night dinner — let’s just hope they maintain that same level of service and quality going forward.